Yesterday, the other students and I had a very impactful cultural experience at the clinic. 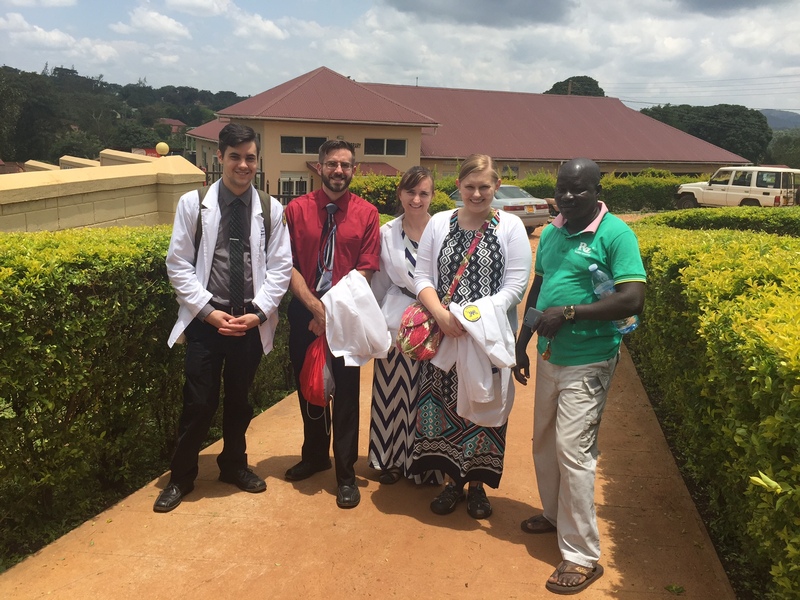 The other students and I were standing outside of the clinic ward with a group of Ugandan men. Only one of them spoke English. The other students and I were talking to each other in English and the men were talking to each other in their local language. It quickly became clear to the other students and I that the men were most likely talking about us. Eventually, the man who spoke English told us that he and the other men had a “crazy” question for us. They wanted to know if they could see our hands. We of course agreed and held out our hands. The men were so fascinated by the white color of our skin. They held our hands, flipped them over, pinched them, and inspected them. I don’t know for sure but I would assume that they wanted to see if there was anything different about our hands and skin compared to theirs. We were able to communicate with them that we really did not believe that there was anything different between us and the men as people besides our skin color. We are all people and that is all that matters. The men also wanted to know about marriage in the USA. They wanted to know if an American woman would be allowed to marry a Ugandan man and if she would move to Uganda. We were able to explain that this would be possible and that in the United States, interracial marriage is accepted by many people. Our translator then went on to say that he wished he could someday move the United States and that he wished he could be white like us someday. This statement really shocked all of us. We immediately replied that we felt that we are the same as them and that our white skin does not make us any better than they. When we are at the clinic I feel that we are a bit of a spectacle to the patients and their caregivers. We are a group of five white people in white coats furiously taking notes while working with the doctors and nurses during rounds. Since many of the patients and caregivers do not speak English, we cannot easily communicate with them who we are and why we are there. I think that this often leads to misunderstanding between us and the patients and caregivers and probably makes the patients and caregivers feel uncomfortable. When we walk into the clinic ward in the morning, we can usually feel the stares of everyone in the room. The unexpected interaction that we had with these men was very important for us as we were able to establish a relationship of understanding with them. I hope that the bond we created with these men is now one of trust and made them feel more comfortable with our presence. The group with Sam, our Masindi driver whom we love! 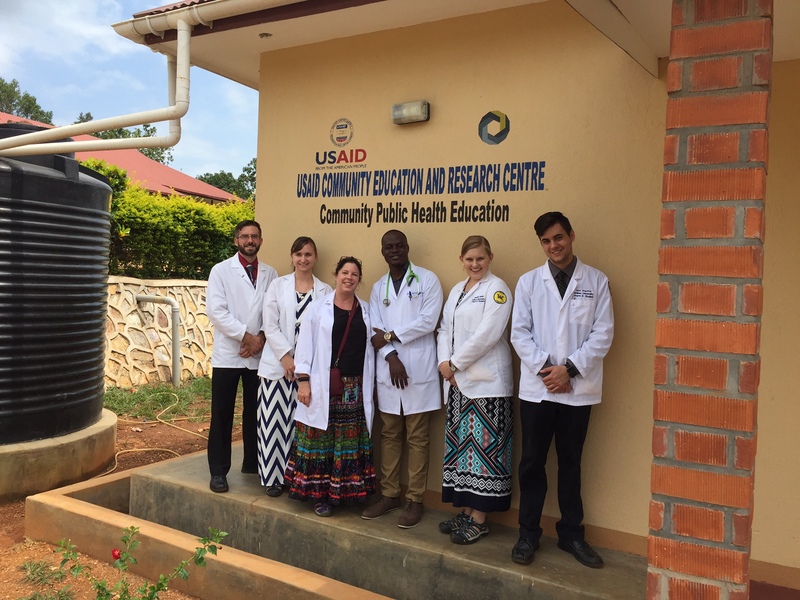 Today was our last day in Masindi at the Masindi Kitara Clinic. We have had a wonderful time here and have learned so much. We are excited to move on to the next leg of our trip but will miss all of the staff at the clinic and at our hotel. 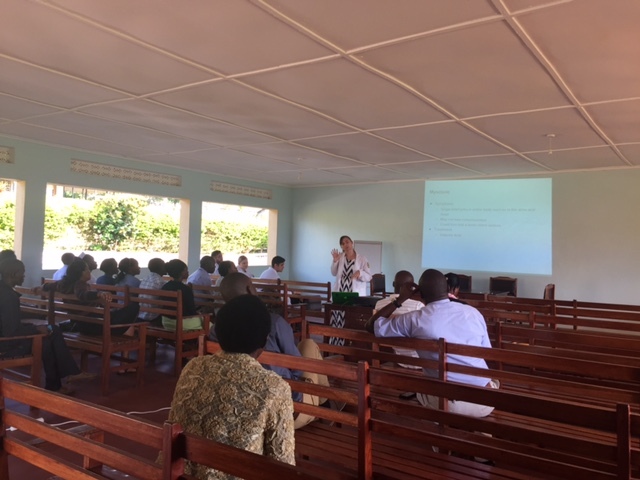 We began our morning by giving a CME to the medical staff at Masindi Kitara Clinic. CME stands for Continuing Medical Education and occurs once a week at the clinic. We based our CME on questions and patient cases we had encountered. The staff seemed to be very pleased with the information that we provided them with. 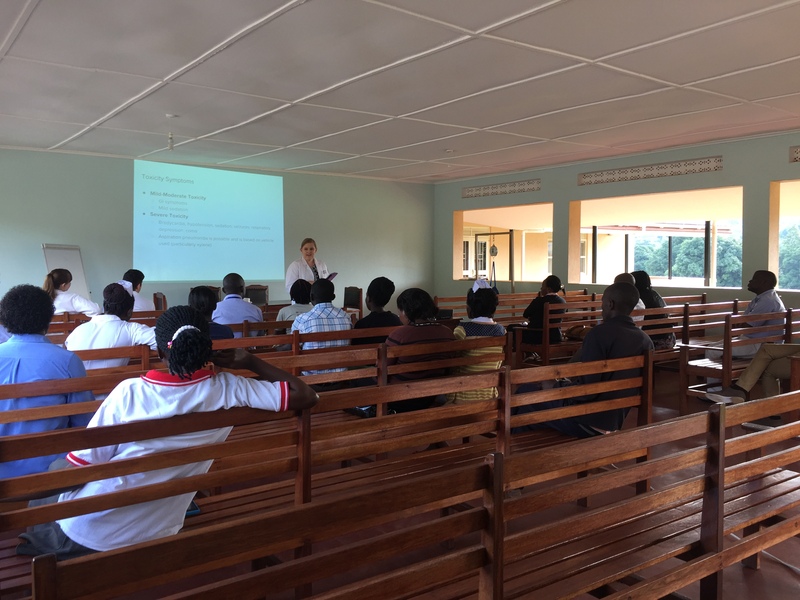 They commented that they really appreciated how we made the presentation very relevant to what they see at the clinic on a regular basis. 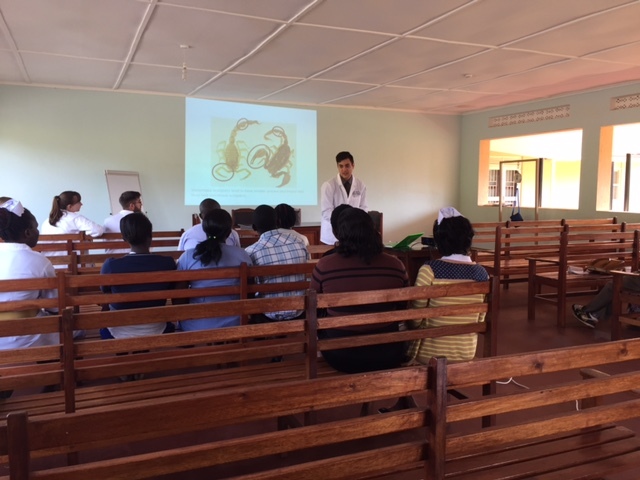 The head physician, Dr. Godson, even made a request to the staff that they follow a format similar to our presentation when giving CME presentations in the future. Later in the afternoon, we stopped by the baby clinic. This clinic is held every Friday. Mothers bring their babies to the clinic to receive all of their childhood immunizations. We were able to watch the nurses do their work for a while. However, the clinic was very busy today and we did not want to be in their way so we moved on to watch Dr. Godson perform a surgery. 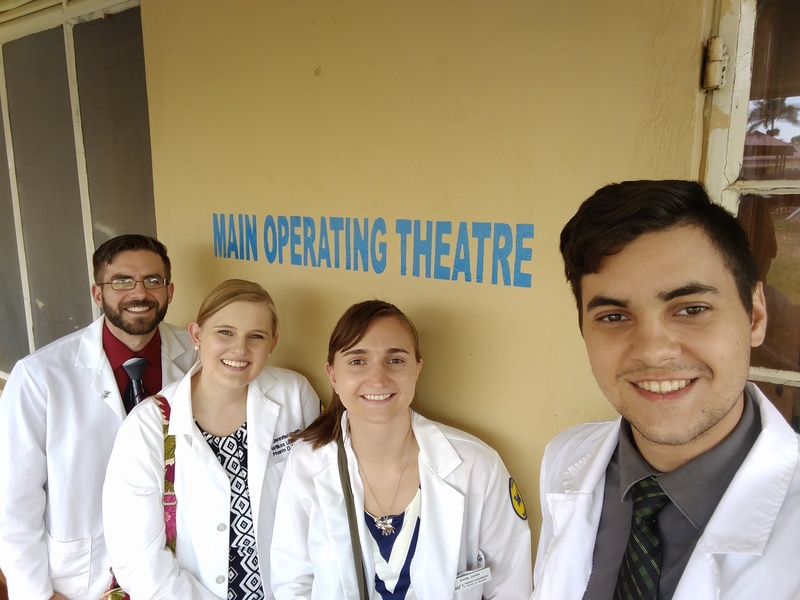 Some of us have watched surgeries in the USA before and it was very interesting to note the differences between the way surgery is performed in the USA versus how it is performed in Uganda. 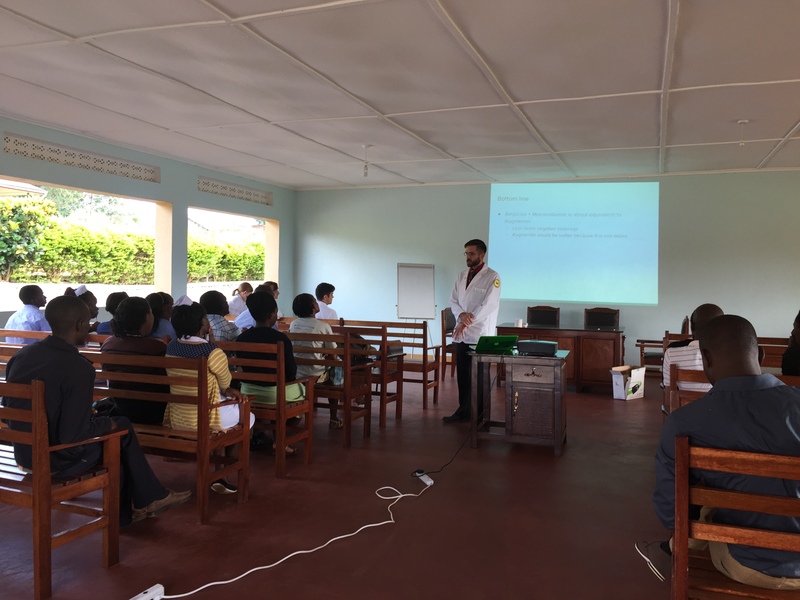 We really appreciated Dr. Godson welcoming us into his OR and teaching us a bit about surgery in Uganda. After we were done at clinic, our driver, Sam, picked us up and took us for a drive to a beautiful overlook. 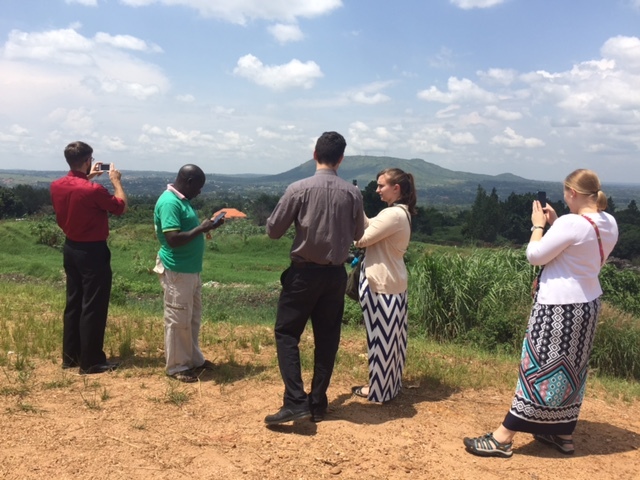 From the overlook you could see the town of Masindi and the surrounding mountains. Enjoy the pictures! This entry was posted in Diseases/Health, My Safari (My Journey/Adventure) and tagged Binghamton University, binghamton university school of pharmacy and pharmaceutical sciences, Global Health, Global Pharmacy Education, international pharmacy, Masindi, pharmaceutical care, Pharmacy Education, Pharmacy Students, Uganda, Wilkes University, Wilkes University School of Pharmacy. Bookmark the permalink. Nice write up Jennie. I so look forward to the daily blog. This is all so exciting. Thanks to all for sharing ur experience. Safe traveling . Will Sam be ur driver the entire time? Hi Mrs Smith- I’m so glad you are reading and commenting on the blog. All of the students are a joy to work with. Sam is just our Masindi driver so he will take us back to Kampala tomorrow but then we will have to say goodbye. We will all miss him! I look forward to reading the blogs every day. What a wonderful experience for all of you. You all look healthy and always with smiles on your faces. Jennie – I still have visions of you sleeping covered by mosquito netting!! and now I have the visions of monkeys that might have been sitting on your balcony. Oh my. I am sure this learning experience will be one you will never forget. Continue to be safe and we will see you back in the USA soon.